The Brokk 200 operates tools with requirements typical of one weight class above. When paired with the new Brokk BHB 305 breaker, the unit’s hitting power is increased by 40 percent. The Brokk 200, a new weight class of machine, packs the power of a 3-ton Brokk machine into a 2-ton package. 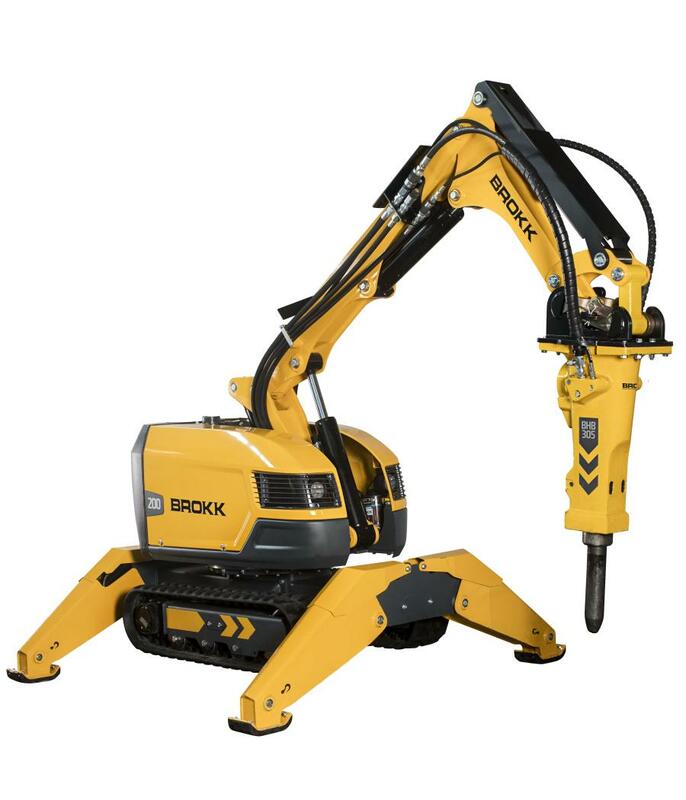 The Brokk 200 is one of four new next generationBrokk remote-controlled demolition machines Brokk showcased at World of Concrete 2019. "When we set out to design the Brokk 200 we saw an opportunity to support customers further by introducing a new weight class,"said Martin Krupicka, president and CEO of Brokk Group. "The Brokk 200 allows contractors to work in tight spaces without a loss in power." The 27.5-kW machine operates tools with requirements typical of one weight class above. When paired with the new Brokk BHB 305 breaker, the unit's hitting power is increased by 40 percent. The new class of machine delivers 450 foot-pounds (610 joules) with each blow of the 650-lb. (295-kg) hydraulic breaker. In addition to its heightened power, the Brokk 200 offers 15 percent longer vertical and horizontal reach in a compact footprint similar to the Brokk 170. The extra chassis length and machine weight ensures proper balance, even when wielding heavy attachments, such as breakers, drum cutters, grapples and concrete crushers. The Brokk 200 is ideal for heavy duty, difficult-to-access projects and applications and represents the new standard in compact remote-controlled power, according to the manufacturer.